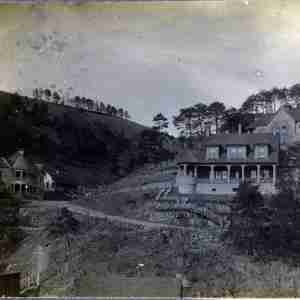 The Marshall House Inn was built as a private residence by James H. White for his new wife Annie Mae White in 1903. 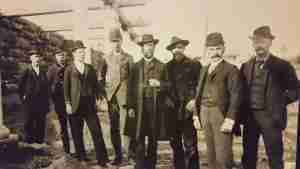 Mr. White had been a sheriff of Madison county as well as a successful local businessman and he hired Richard Sharp Smith who had been the supervising architect of the Biltmore Estate to design his new house. The exterior of the Inn is covered in Roughcast or Pebbledash which is a mixture of cement and small stones very common in England at the time and found in many buildings in the Biltmore village area of Asheville which were also designed by Smith. The house originally had 3 bedrooms upstairs along with a wood room and linen closet. In the 1920s Mr White became Ill and the house was foreclosed upon in 1922. The house was purchased by the Ramsey family in 1923 and they made major changes to the 2nd floor by changing the 3 rooms into 8 bedrooms. It appears this was done as the result of a large fire which occurred at that time. We found evidence of this fire while renovating the home including the use of burned timbers to frame the new walls. In 1936 the house was again lost to foreclosure. In 1940 James and Bessie Penland purchased the house and opened it up as the “Balsam Tourist Home.” The Penland family was involved with several businesses in town of which the Penland and Sons Department store still exists and is run by their descendants. Be sure to stop by this great old timey store just down the hill on Main street. The Penland family continued to run the Balsam Tourist Home until the mid 1988 when it was sold to Ruth and James Boylan who ran it as the Marshall House Bed and Breakfast. In 1989 the house was added to the National Register of Historic Places. In January 2016 the house was purchased by John & Kerstin Davis who began renovating the house.